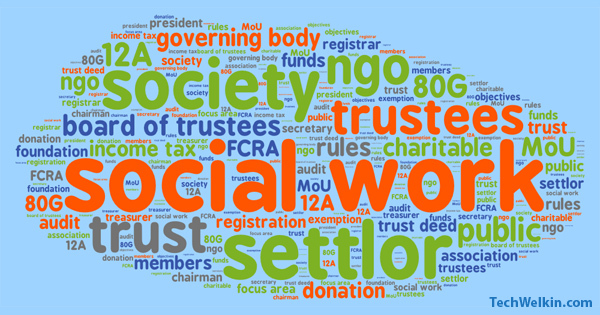 A number of people ask if it is possible to make a non-resident Indian a trustee in an Indian trust? Let’s explore what Indian Trusts Act 1882 says on this issue. Can an NRI be a trustee in India? My readers have been asking this question since the time I wrote my first article on how to create a public charitable trust. I get these queries from non-resident Indians (NRI) as well as from people residing in India. At times, NRIs want to start a trust in India because they want to do some social work. At other times, a trust started by Indians want to include an NRI in the board of trustees. The question rises whether it is at all possible to bring an NRI person in the board of trustees. Let’s explore the issue and see what different clauses in the law say about it. As you may know, trusts in India are governed by the Indian Trusts Act 1882. Most of the states have adopted this act and other have adopted it with a few changes. This act has sections that stipulate as to how a trust should function and who can be a trustee. Can an NRI Become a Trustee? This language is a bit confusing and leaves scope for multiple interpretation. This portion of the act deems an NRI unfit to be a trustee because of his/her absence from India for more than six months. At the same time, this section does not bar the Author / Settler of the Trust or Board of Trustees from appointing an NRI as a trustee. The beneficiary has a right (subject to the provisions of the instrument of trust) that the trust-property shall be properly protected and held and administered by proper persons and by a proper number of such persons. A person domiciled abroad: an alien enemy: a person having an interest inconsistent with that of the beneficiary : a person in insolvent circumstances; and, unless the personal law of the beneficiary allows otherwise, a married woman and a minor. This section states that beneficiaries of the trust have a right to have proper trustees. It further says how proper it is to make someone a trustee. Section 60 also explicitly says that it is improper to appoint a person domiciled abroad a trustee. SEE ALSO: Can a Trustee Take Salary / Remuneration from Trust? The act also states that a trustee has to be amenable to the jurisdiction of the Civil Court of India. An NRI person remains out of the jurisdiction of the Indian civil courts and if that person does not act as a proper trustee, the Indian courts will not be able to take an action. Despite all this, there is no explicit restriction on an NRI becoming a trustee in an Indian trust. See, as I said before, the act is not clear on this question. The settler or board of trustees may appoint an NRI as trustee but such an appointment may face legal hurdles later on. Therefore, if it can be avoided, it is better to appoint only resident Indian citizen as trustees (who also fulfill the requirement stated in Section 10). The NRI person must be competent to enter into a contract as per Indian Contract Act, 1872. You should also note that a trust in which an NRI is a trustee can not do anything which is prohibited in India for the NRIs. So far, this is all I have on the question of whether an NRI can be appointed as a trustee. I am still consulting a couple of lawyer friends on this topic and I will update the article if I will have any new information. If you have any relevant information, please let me know through comments section. Thank you for using TechWelkin! Thanks a lot for your information and inputs to all those who want to start a trust. I am starting a Trust to help the needy poor students who cannot afford their education. I have read almost all your posts. Now will contact a good lawyer to proceed further. Will be writing back if any help needed. A) Can the same person be the settler and one of the trustee as well within the same trust? B) Can there be more than one settler? C) We have worked for around a year, collecting donations and executing social works from the donated funds. The new trust that we are going to register now is to formalise the process while we continue doing fund drives and similar kind of works as before. Would this previous 1 year record of works be counted when we apply for 80G and FCRA? 1) Settler is just a term for a person who starts the trust… it has no other significance. A settler is also a trustee. 2) I guess there can be more than one settler. But I don’t see any need of this. 3) Previous works/records are not really counted towards FCRA. As for 80G, you can apply for it right after registering the trust. To continue my prior inquiry, this project, simple trust is completely funded by my savings from my income. so I may not be able to contribute continuously for years, so the trust should have the option of revocable. Fund comes from 2 hours’ rental income in India and from my savings in USA. Also what would be the tax consequences for Rs. 50,000 to 100,000 /year when already paid heavy taxes in USA. I have researched for months and finally 2 sources – one lawyer /India asks at least Rs. 75,000 to complete this simple trust, and another one said, i just have to go through CPA/accountant and that should be enough. Based on your article, it looks like i should be able to do it by myself? I am from Tamil Nadu.south India. Hi Sandra, my articles on TechWelkin are about public charitable trusts. I do not have sufficient knowledge about private revocable trusts. Sorry about that. 1) What should I pick – Society, Trust, or Foundation? 2) Can I become a Trustee (because I am still an Indian citizen and won’t change my citizenship)? 3) If I can’t become a Trustee, can my two brothers who are Indians and residents of India become Trustees? 5) Any requirements as far as receiving money from others and any other information that I need to know? Shilpa, my first advice would be to contact a qualified lawyer who knows the nitty-gritty of this matter. Choice on the type of NGO is entirely up to you and your purpose of having an NGO. Your brothers can certainly become trustees. One of my freind is planning to open a trust in India. The main purpose of the trust would be giving scholorship to poor students. He is planning to generate funds from foreign countries from his students who got settled in foreign countries and who are willing donate some amount towards some social cause. Can he run this kind of trust and get 12A registration? If there are any drawbacks please let me know. You can receive funds from foreign countries if you have FCRA certificate. Contact a good CA or the IT Tax office for knowing more about FCRA certificate. Can a non resident of India be part of the founding members of the society? We are 7 but out of 7 of us, 3 are in India, 2-4 are permanent residents and 1-2 as citizens abroad. Also, I have another qs but will wait for this to be answered first. I am not sure about society, but I guess similar rules will apply to the governing body members of a society. Can someone let me know if an NRI can start a trust in India? An NRI cannot start a trust in India since the FDI policy specifically prohibits FDI in Trust. Mr. Lalit, is there any age criteria to become a member of the trust? The trustee has be at least 18 years old. First of all, I should appreciate you effort for providing information to the public through this page. I am working in the Middle East on project basis for some period. Now I am thinking of starting a trust in my hometown in Karnataka, INDIA. But I want to manage the trust from here without any office space for the time being by recruiting one known person. Can I run the trust only by myself. I wanted to create website for the trust, so I need more details. How to register and whom to approach. Can I open bank account for the trustee by giving my ID details without office. In order to start a trust, you must have minimum two people who wish to be trustees. You also have to have a registered office for your trust.